President Nicolas Maduro won the Venezuelan presidential elections Sunday, gaining a second presidential term for six years with more than 5.8 million votes. May 21 (teleSUR) A day after the Venezuelan general elections, China and Russia called Monday for respecting the country’s democratic process and rejected attempts of interfence by the United States and other regional powers. “The parties involved must respect the decision of the Venezuelan people,” said Chinese Foreign Ministry spokesman Lu Kang at a press conference in Beijing, as he encouraged resolving any dispute through legal channels, EFE reported. Kang affirmed China’s policy of not interfering in internal affairs of other countries and was convinced that the Venezuelan government and citizens will be able to resolve the issues. “China will address the relevant issues in accordance with diplomatic practice,” the spokesman added. President Nicolas Maduro won the Venezuelan presidential elections Sunday, gaining a second presidential term for six years with more than 5.8 million votes, the country’s National Electoral Council (CNE) reported. The opposition candidate, former governor, Henri Falcón came second after Maduro – and the evangelical expiator Javier Bertucci have made accusations of irregularities. Maduro’s win comes at a time when the United States and its right-wing regional allies as well as several European governments have made several attempts to intervene in Venezuela’s presidential elections through sanctions and boycott calls against the Venezuelan election saying they won’t recognize the results, policies that were rejected by the Russian Foreign Ministry Monday. “We regrettably have to note that in these elections, in addition to the two traditional participants, that is, the Venezuelan people, the electors, on the one hand, and on the other the candidates who presented their programs … there was a third participant, the governments who openly called for a boycott of the vote,” said Alexánder Schetinin, director of the Latin American Department of the Foreign Ministry. Schetinin also added that Russia is often accused of meddling in other countries’ elections but in Venezuela’s case, some countries have meddled indiscriminately. “And even worse when a whole series of governments, including the one you are appointing (United States), a priori declared that they would not recognize the results,” he said during a press conference, the Interfax news agency reported. 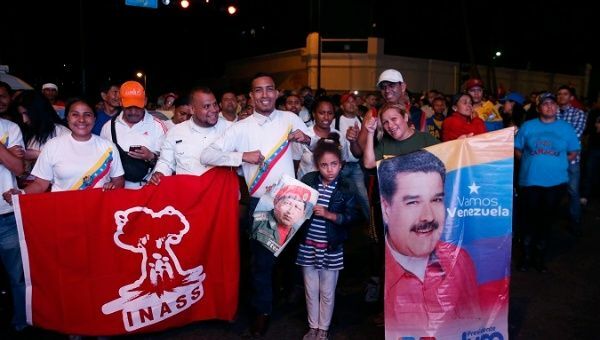 “The elections have been held and their results have an irreversible character: two-thirds of the votes went to the current president of the country, Nicolás Maduro,” he concluded. While Many countries in Latin America have recognized the Venezuelan elections and congratulated President Maduro, such as Cuba, Bolivia and El Salvador, right-wing governments in the region have dismissed the vote as “illegtimate” echoing statements by the U.S. and Canada and some Western countries who had dismissed the vote and teh results before the election had even taken place. The so-called Lima Group plus Canada issued a statement Monday saying it did not recognize the legitimacy of Venezuela’s presidential election. The statement said the countries would call their ambassadors back from Caracas for consultations and hold a meeting to coordinate a regional response to what they call “crisis” in Venezuela. They also said they would seek a new resolution on “the situation” in the South American country. Such attempts of interference into Venezuela’s internal affairs have repeatedly been rejected over the past few months by the government in Caracas as well as left-wing governments in the region. The Lima Group includes Peru, Argentina, Brazil, Mexico, Panama, Paraguay, Santa Lucia, Canada, Colombia, Honduras, Costa Rica and Guatemala.